It's been awhile and so much has happened! 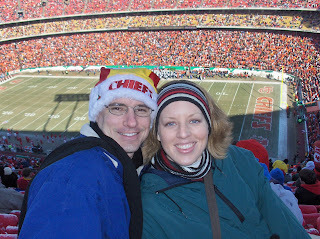 First, we did attend the KC Cheifs football game (which they lost). After we broke the ice off of the chairs and got our heat packs warmed up, it was very enjoyable! 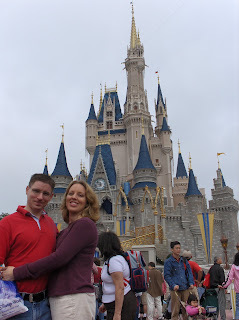 Over Christmas we went to DisneyWorld! It was fantastic. We managed to visit 4 parks in 4 days as well as have Christmas dinner in the hotel and have a traditional Christmas brunch, gift opening, and a gift exchange. It was a lot of fun, but it was over much too quickly. We returned from the sunny Florida heat to find 4 inches of fresh snow on our car. A nice "welcome home" from the state of Kansas. So now we are into the New Year and back to the regular routine. Kevin and I are back to work. We had another doctor appointment on January 4 where we heard the baby's heart beat. Everything was going well. We are now at 17 weeks and I am starting to show! On February 8 we will be finding out if we are having a boy or a girl. We are super excited and are very much enjoying the process. I have not been sick at all, just tired (and maybe a bit lazy). But all is well. We would love to hear from you all about your holidays. Love the pictures of the snow! Sounds like ya'll had a great Christmas! 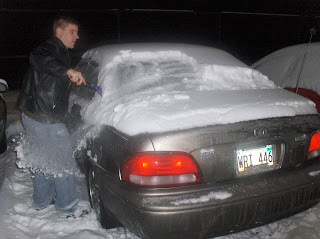 It was so thoughtful of you to hold the camera while Kevin scraped the windows. I am so excited for ya'll!!! 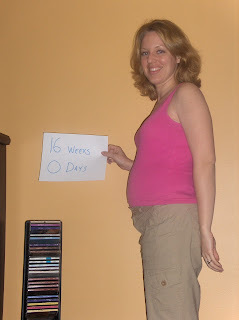 You look great Tonya and it is fun to see that the baby is growing!!! love you! Hey girl! I just found your blog. I didn't know you are pregnant! Congratulations!!! I hope everything is going well!